Bargain of the day: ASOS pink unicorn socks! Storm Imogen may be ruining our hair do’s and it may be a Monday, however if there is anything that is guaranteed to put a smile on your face it is a bargain. And this bargain comes in the form of pink glittery unicorn socks that cost just £3 from ASOS. As well as warming up your toesies in this rubbish weather, they are also guaranteed to put a smile on your face! Seeing as the sun has actually started to come out, it only means one thing – everyone gets excited for summer! That means that it is time to start getting your summer wardrobe in order and what better to accessorize your new fancy clothes with than new summer shoes. However, I know that you have all no doubt spent most of your hard-earned wages on holidays and festivals. 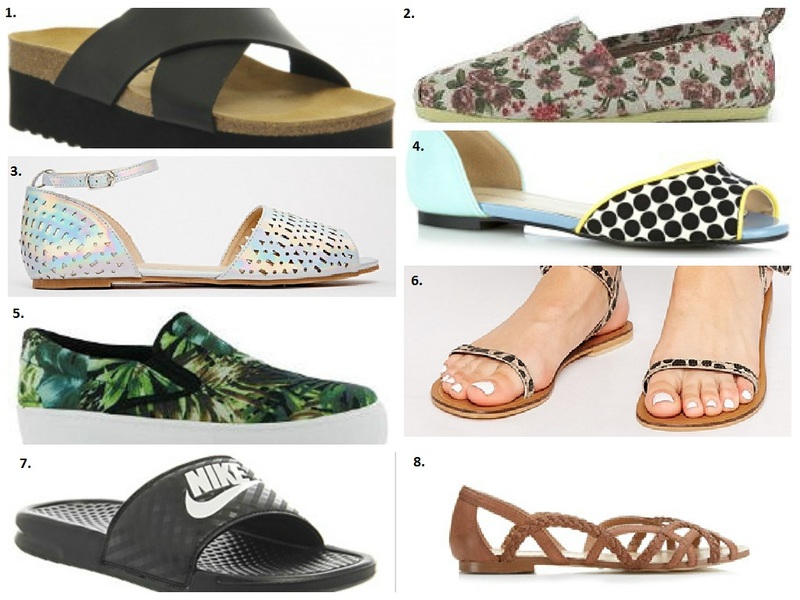 That is why I have picked out the eight best summer shoes under £30, to keep you and your purse happy. Check them out below, hope you find something you like! 1. Office Warner Double Height x Strap Footbed – £28 – Give yourself some height without the hurt in these Office platforms. 2. Soul Cal Long Beach Ladies Canvas Shoes – £13 – These flowery numbers are such a bargain at just £13! 3. ASOS JAMILA Laser Cut Two Part Sandals – £22 – Metallic is definitely in this summer. Team with a white dress or with jeans to keep your outfit looking fresh. 4. Red Herring Aqua Spotted Colour Block Pumps – £16 -Perfect for the evening, these pumps will brighten up any summery outfit. 5. Fabric Hustle Slip Ons – £15 – So summery it almost hurts! I’d pair it with a bright top for that full-on tropical vibe. 6. ASOS FATED Leather Sandals – £16 – Get your toes out in these lush leopard print sandals. 7. Nike Women’s Benassi Slide – £18.99 – These are perfect for the sport / casual look or looking chill will teamed with a bikini around the pool. 8. Miss Selfridge Eastern Tan Flat Shoe – £25 – You can’t go throughout summer without a good pair of tan shoes. These will look great with a summer dress or skirt.